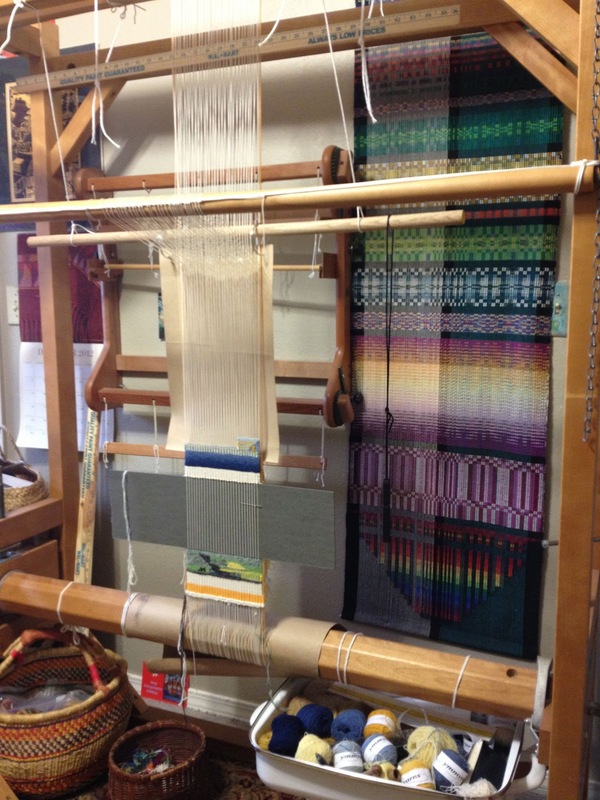 Most of the time I am weaving during the day and am fairly well behaved at the loom. I usually play CD's or listen to Sirius radio, I enjoy channel 31 The Coffee House, sometimes I have an Indigo Girls marathon or a week of Celtic music. I have discovered that Tchaikovsky's Scheherazade makes great weaving music. 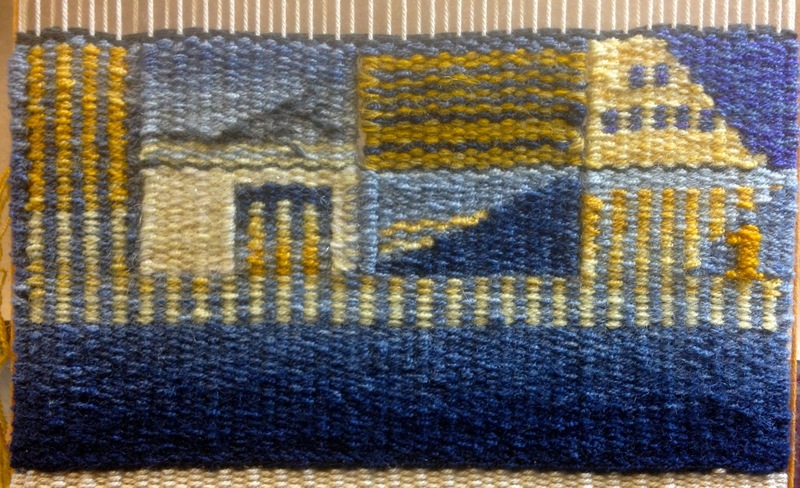 Lately though I have been doing a little weaving at night, sometimes it is more peaceful then with less distractions. I think I have been doing this for a while but last night I discovered that I sing when I weave at night, pretty loud so my husband says. 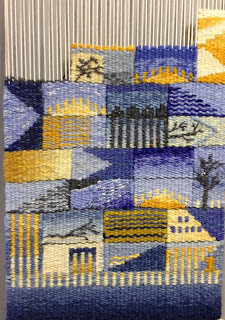 I know lots of songs and it occurred to me that the songs I was singing might have something to do with how the weaving was going. Last night I must have been in need of inspiration because I started off with Climb Every Mountain, then settled into an Indigo Girls tune, Closer To Fine and my last selection of the evening was You've Really Got A Hold On Me, you treat me badly, I love you madly... so there it is, confessions of a loom singer. 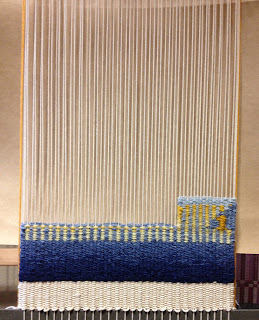 Evidently it must be working because the weaving is growing well this month. Now I am wondering, am I the only one? Here is the January diary through Jan 24. January is the birthday month around here, both of our sons and I are born in January. I decided to weave a little rising sun shape for the birthdays and I thought it was interesting how the two boys ended up in the same position on the weaving in different weeks, mine is the one on the left hand side and the three of them make a triangular shape. I may weave another sun shape in February for DH, Francis. I have been enjoying working with these colors , next month I plan to add some more grays and red violets into the mix. I'm adding a few trees and branches because those bare branches do seem to really stand out in January. Speaking of Birthdays, I was at the Dragonmoon for lunch with friends the other day and Susan made me a Red Velvet Cheesecake in honor of my birthday. It was so pretty that I had to take a picture before I started. 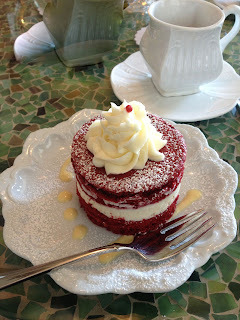 She said it was a test desert for the Valentine's Day Tea, but I can tell you it was the best test I have ever had! Thank you Susan, Lynn and Margaret for making it a special day! This could be a tapestry! Work on the Mango Hunters is coming along too. Must be all that singing. I can see the halfway point very close ahead and that is pretty exciting. 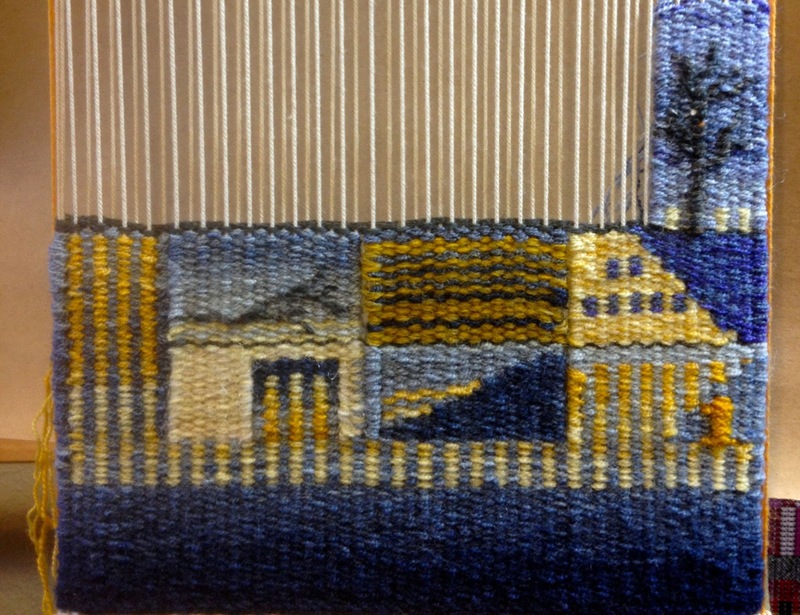 I have heard that Champagne toasts are in order when the tapestry is finally cut from the loom. I wonder if I can start a halfway point celebration? Here are a couple of details of the Mangos with the threads pulled out of the way. 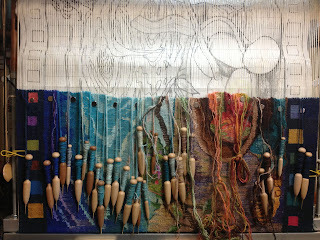 The one on top is what I see weaving and here is one turned with the magic of iPhoto. Looks like I have a lump that needs reshaped! 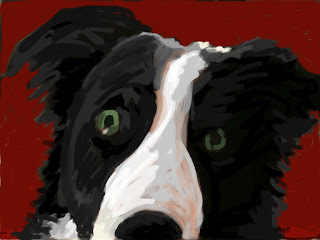 I did a sketch of my Border Collie, Laddie on Brushes the other day. He is such a sweet boy, though a little intense and serious about playtime. I want to do a little 4 inch square tapestry and so I thought I might be able to crop this and use it as an idea for the tapestry. I also ordered some linen threads for warp that I want to try. 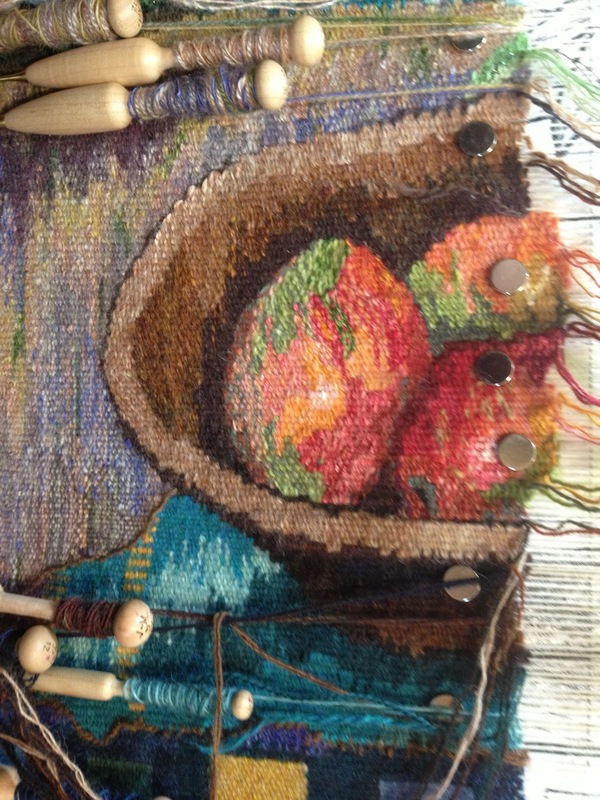 Here is the cropped design and a couple of linen threads that I can use as warp. I thought this would be a great way to try out the linen. 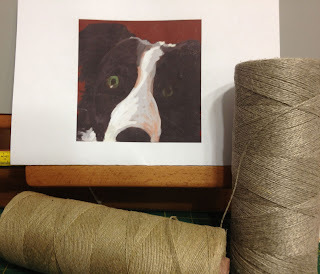 I am not warped yet and still pondering my Laddie portrait but this should happen soon if it is going to. 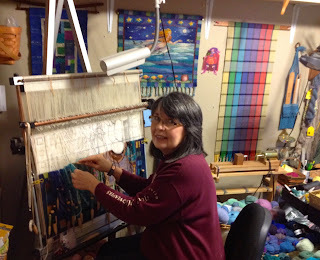 I am weaving the new year in with lots of plans and projects! The black-eyed peas are on the stove, to be accompanied by cole slaw and cornbread later. It is a chilly day here in Oklahoma as expected in January and we have actually had some rain! All good omens for the new year. Funny how rain, which was a daily occurance while growing up in southern Florida has become an event. I have been thinking a lot lately about what I want to achieve in the new year and have made some decisions which are of course open to revision but do offer that very important place to start. My first goal for the new year is to make real progress on the Mango Hunters. 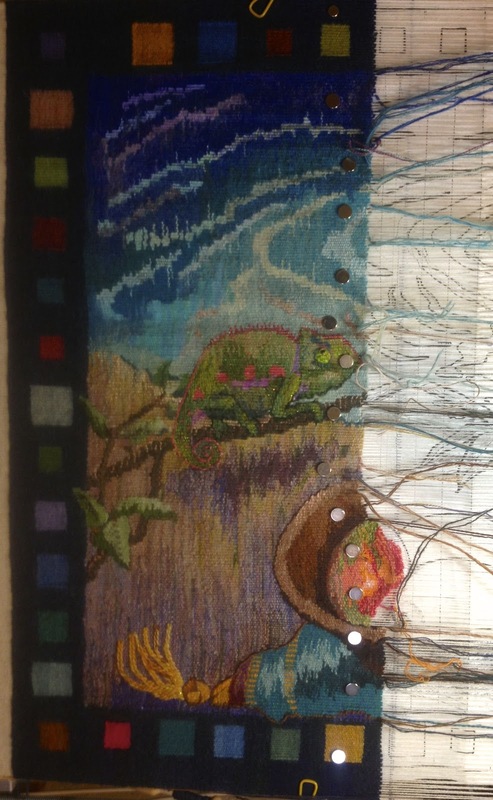 I have been working on this tapestry for several years now and it has survived a tremendous number of life changing circumstances. I am usually pretty good at letting go of projects that just don't work, or for one reason or another aren't valid any more but I have held onto this one for various reasons. It is a design that I put a great deal of thought into. Originally it was to be a painting but just never seemed to work in that form. 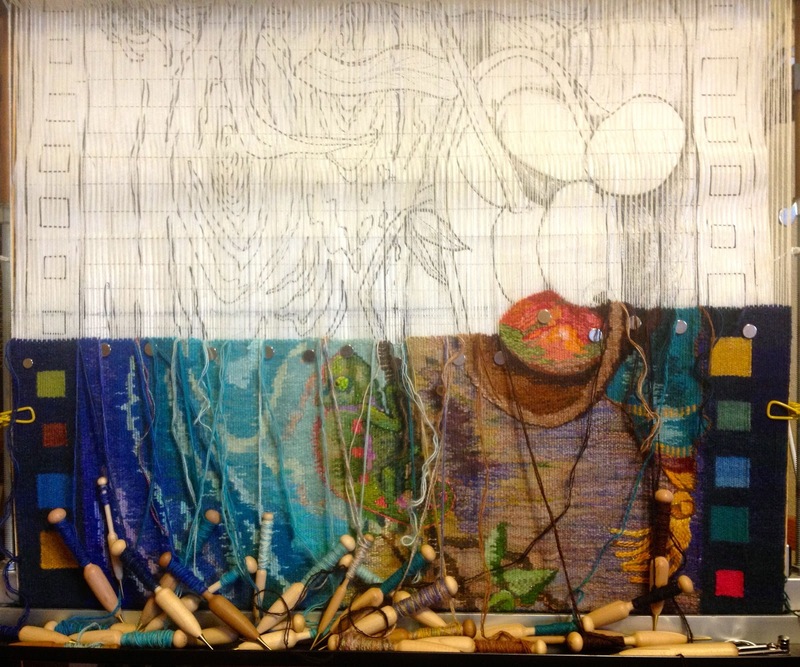 When I started it as a tapestry I began to see the effect I was after. It is a combination of landscape, still life, fantasy and is a very personal narrative journey. This piece is on my Mirrix Joni Loom and an easel stand and set up with the Mirrix treadle. 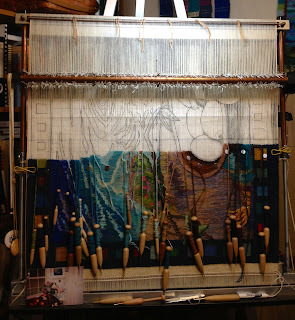 One of the challenges of weaving it, is that I am working from side to side in the design. 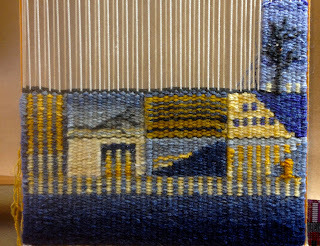 Although this is not uncommon for tapestry weavers I am finding it challenging for this piece and often stop to take photos so that I can look at the weaving from the correct direction. My hope is to see this coming to conclusion by the end of the year. Okay, I have put that in writing. 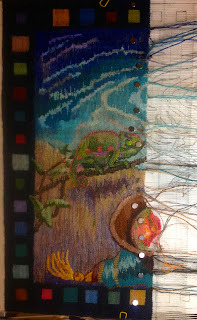 If I have relearned anything from doing the tapestry diary this past year it is that progress is not about spurts of creative energy (although they have their place) but more about steady progress. This could be especially true in the medium of tapestry weaving but whatever you do, getting into the studio and doing it everyday whether you feel like it or not creates momentum and progress. I hope to be sharing more about this project as progress happens. I have also given thought to my tapestry diary project for the new year. 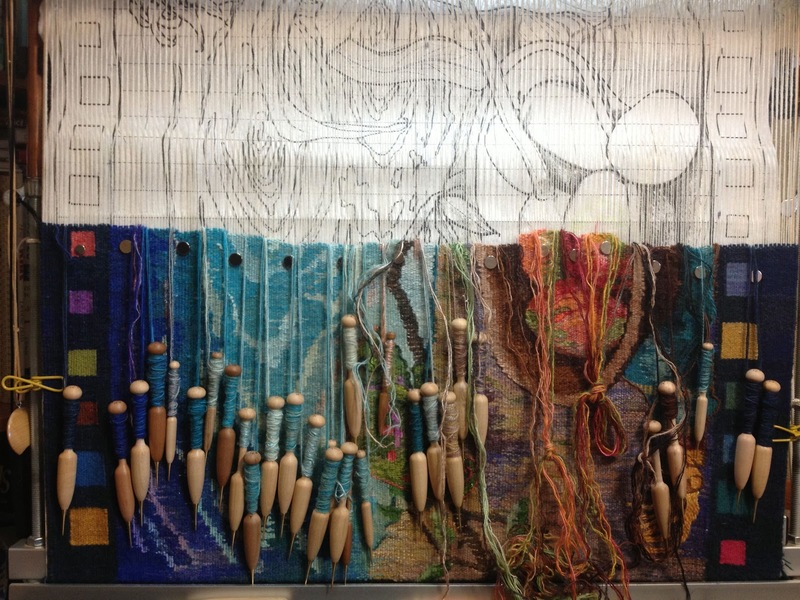 I started the tapestry diary during a class with Tommye Scanlin at Arrowmont school in Gatlinburg, Tennessee last summer. I didn't really have a plan when I started so I used some sketches that I had done around the grounds at Arrowmont for inspiration. 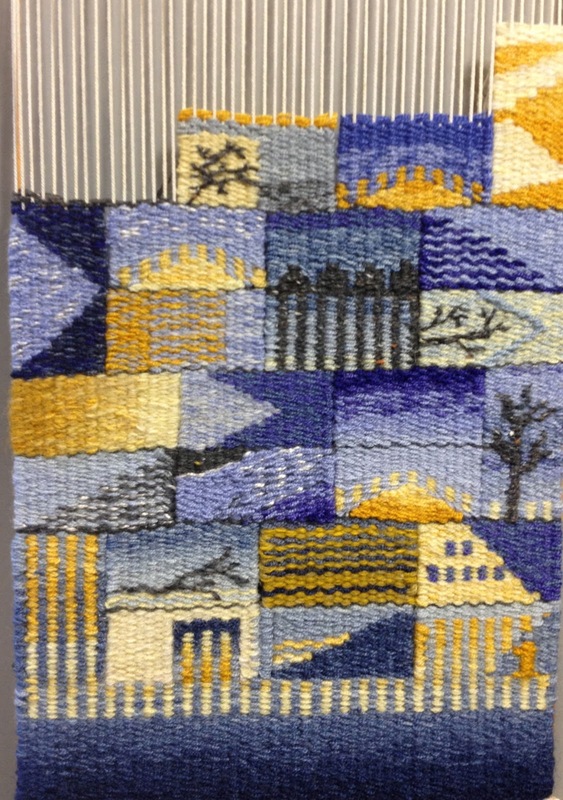 If you would like to know more about Tommye Scanlin and her amazing tapestry work or Arrowmont school there are links to the right on the blog. 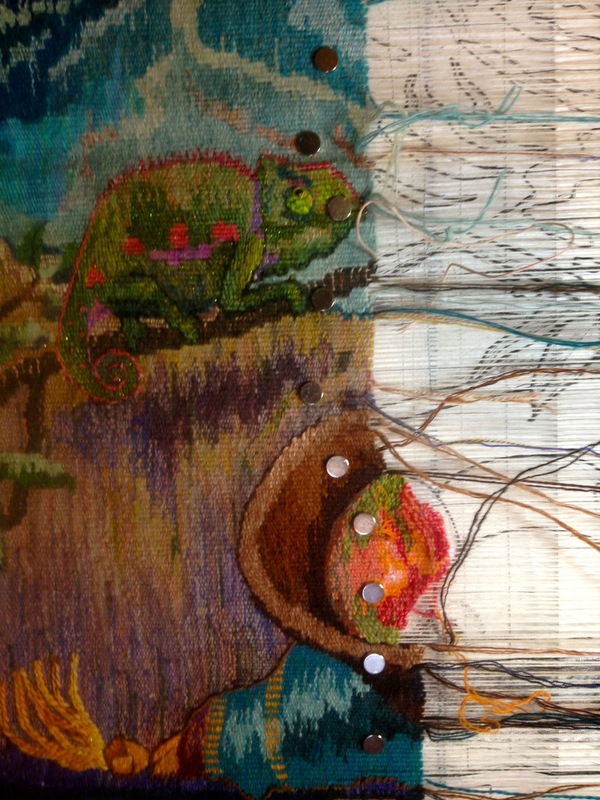 Now that I can look at the last six months or so of tapestry diary I can see that I was very interested in making it personal, taking events from my daily life and finding a way to weave them. This approach needed quite a bit of thought, and sometimes involved making sketches of my ideas before weaving; in short the project has consumed my tapestry time since it started . Everyday does come around every day though and I can remember remarking to a friend that some days were hummingbird days and others were little dot days! I needed to find a way to continue my daily practice and also put more energy into some other projects so I have come up with a different approach for this year. Fortunately, a daily practice like this is all about having it your way with no rules except your own and even those can be changed as needed. Since this will be my first opportunity to weave a full year I decided it would be fun to have the diary all in one piece. Above is a picture of my Le Clerc Gobelin tapestry loom with my warp for the new year and a bit of weaving in progress. 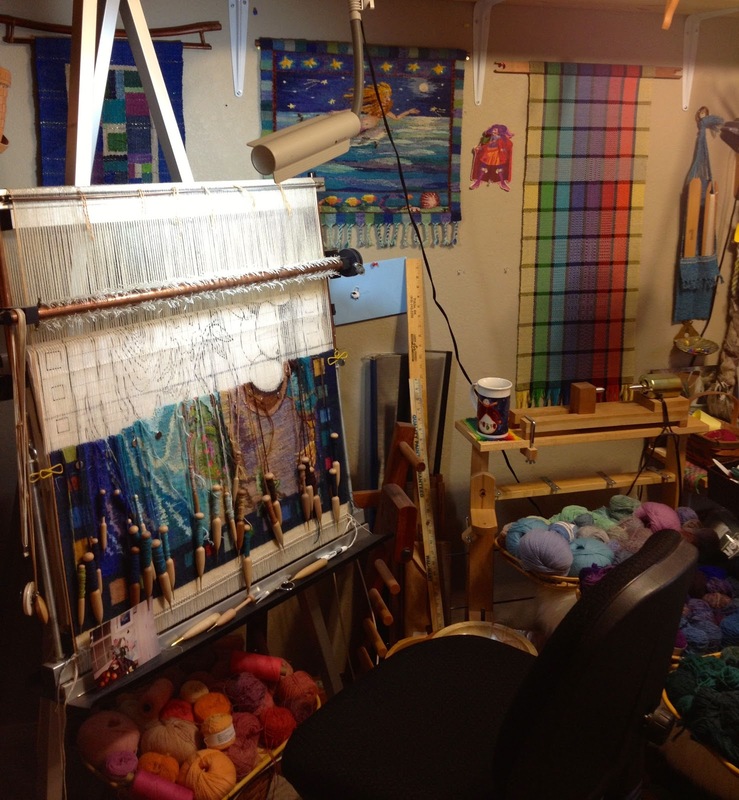 Using this loom is giving me the opportunity to have the whole year all in one piece and to become more confident with using leashes for tapestry. If you are curious about warping this loom Rebecca Mezoff has a very informative post about it on her blog which is listed on the right of this blog. Second, I thought it would be great to really explore my palette of Ymmyarns and so I am going to concentrate on the wool palette although I may end up using some silk as well. Third, I have planned a design based upon a simple repeating motif that will give each day about 1 inch by 2 inch space but should offer plenty of room for variety and last but most important I am thinking of the project this year more in terms of a daily practice than a diary. My plan is not to have much in the way of pictorial content but more work with color transitions and pattern. It remains to be seen how long I can stick to the plan, but I am hoping that this approach will lead to a smooth transition from the daily practice piece to the larger tapestry. I am going to think of these two projects as a team. Here is the first day of January, 2013. 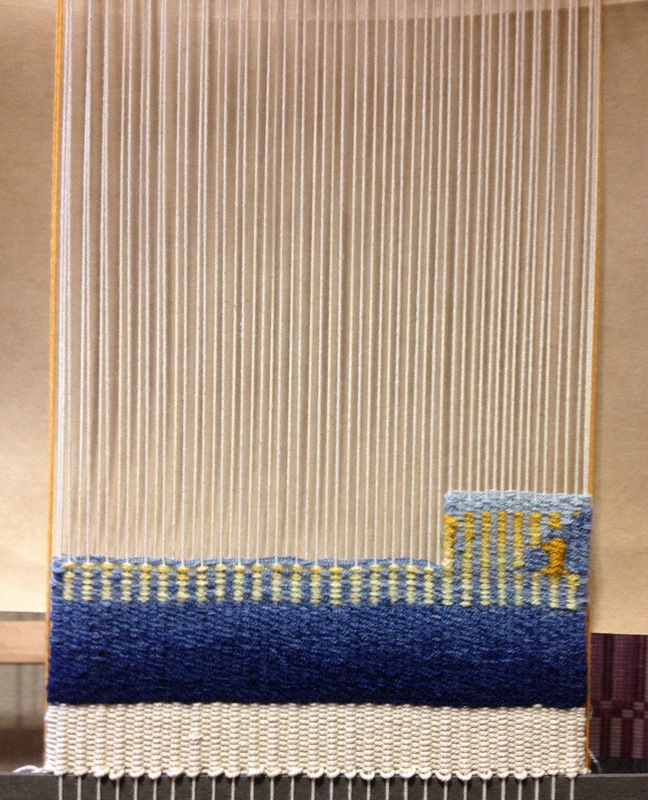 The base weaving was put in ahead and the little rectangle is the first day. It will take a pass across the width and back to do a week and about two weeks for the entire repeating pattern to surface. Of course I will still be fitting in some woven jewelry and the Sheep Breed Sampler tapestry will be my only portable tapestry for a while so I will be catching up with that soon. It is about one half finished and I still need to spin about twelve different breeds for it so there is some spinning in my future as well. I am pretty excited about getting to work for the new year ! 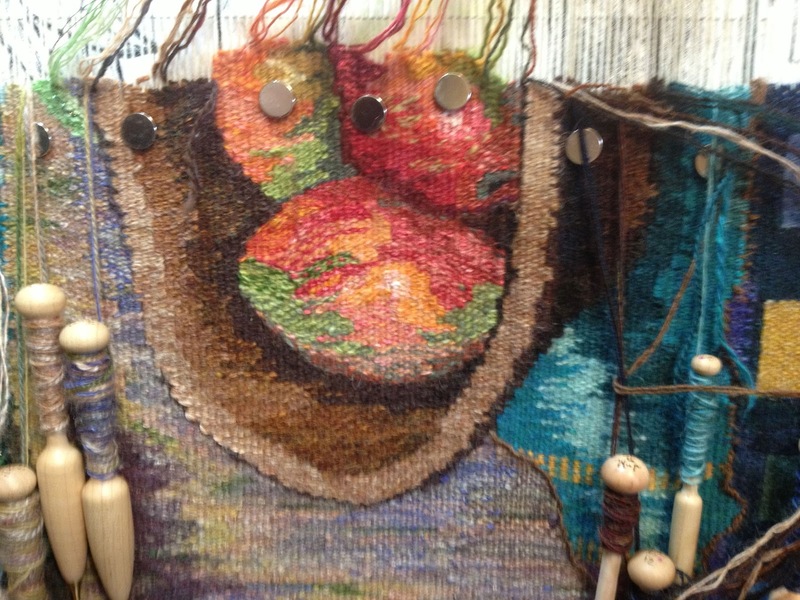 Now I am going to concentrate on lining up some classes and shows for the year and more preparation for the Tapestry Study Group that meets for the first time next week. 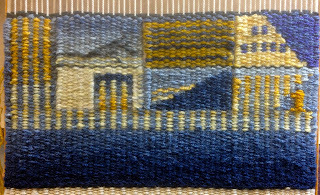 This will be after the regular Tulsa Handweavers Guild meeting and if you would like more information just use the Tulsa Handweavers link to the right. I'm wishing y'all steady progress towards your aspirations for the new year!